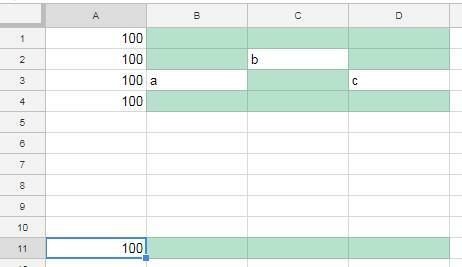 I'd like to set up conditional formatting in columns B:D such that blank cells in B:D are highlighted but only when the same row in A is NOT empty. You got pretty close with your idea about ISBLANK. 2) cell B or C or D = whether they are blank (that's the impact of the absolute column reference). If cell A is NOT empty, then apply the formatting to the cells in Column B, C, and D UNLESS the respective cell B, C or D is not empty in which case don't apply the formatting to that non-empty cell. This is the screenshot of the indicative outcome.